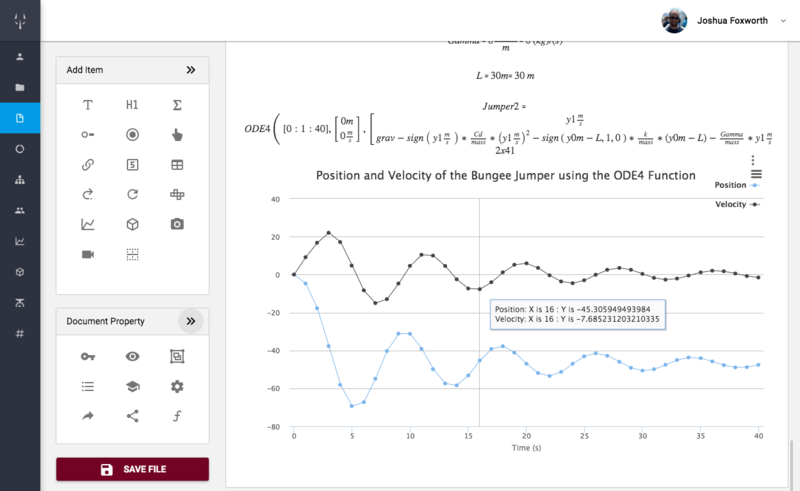 CADWOLF lets users build web pages that solve mathematics in real time, acting as both documentation and analysis. These documents link directly to CAD for real time updates. 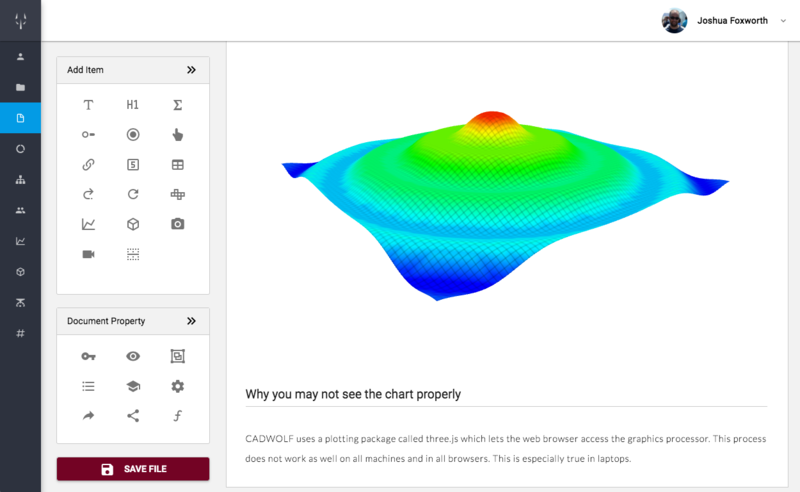 CADWOLF has four main types of web pages - Documents, Workspaces, Datasets, and Part Trees. These components work in concert to provide a platform that encompasses all facets of the engineering process. Documents are where users create web pages that have text, equations, plots, and many other things. These web pages act as both Word Documents as well as programs that solve equations. Workspaces are web pages that act as folders where documents and other items are stored and retrieved. 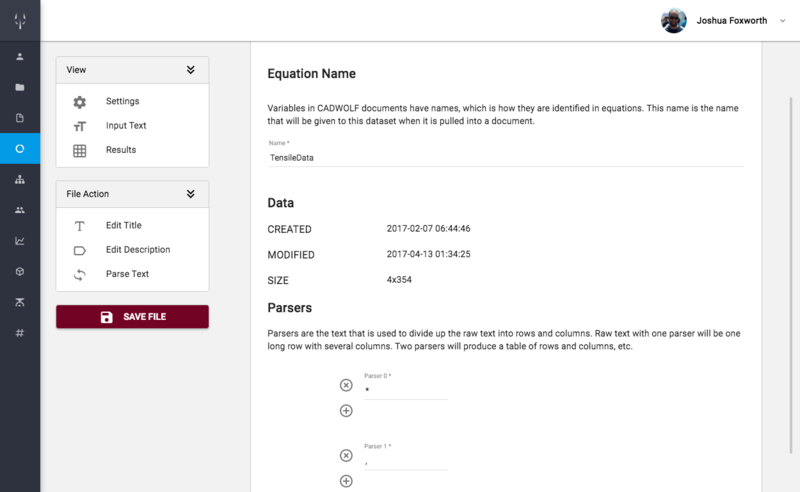 Datasets provide a method for users to import data into CADWOLF documents, and part trees link all of these things together to provide a new level of functionality for engineers. Documents are web pages that are formatted to look like and function much a Word Document. Documents also have the ability to add and solve equations in real time. These equations solve top to bottom, just like a programming language, and the equations can be used in plots as well. Geared for engineers, documents solve for units in the equations, require no programming, and formats the equations to be mathematically appropriate. 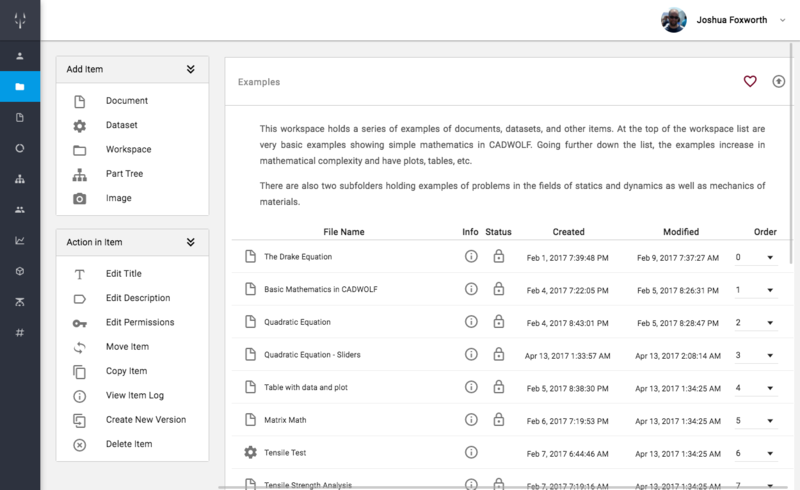 With any platform, there is a need to organize files and data. 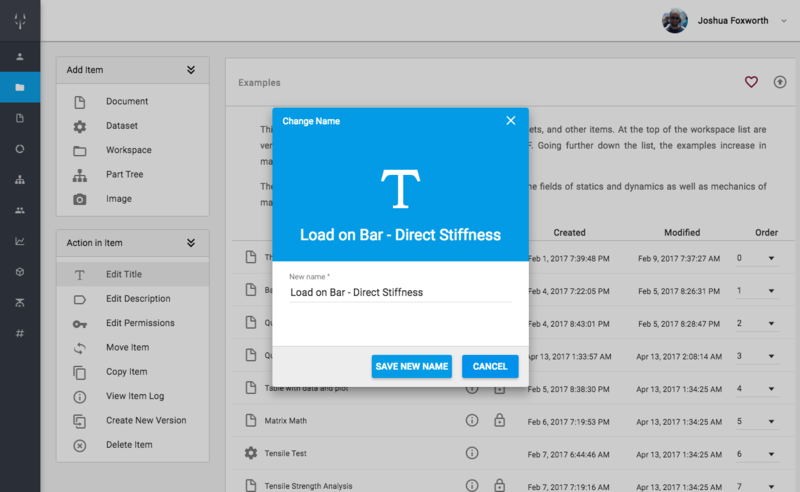 Workspaces are web pages that are formatted to look like standard folders. This is where users add new documents, datasets, images, and other items, and where those items are accessed. Every user has a base workspace that is the same as their user name located at /Workspace/userName. Each user can also assign permissions for other users to view and edit their documents and folders. 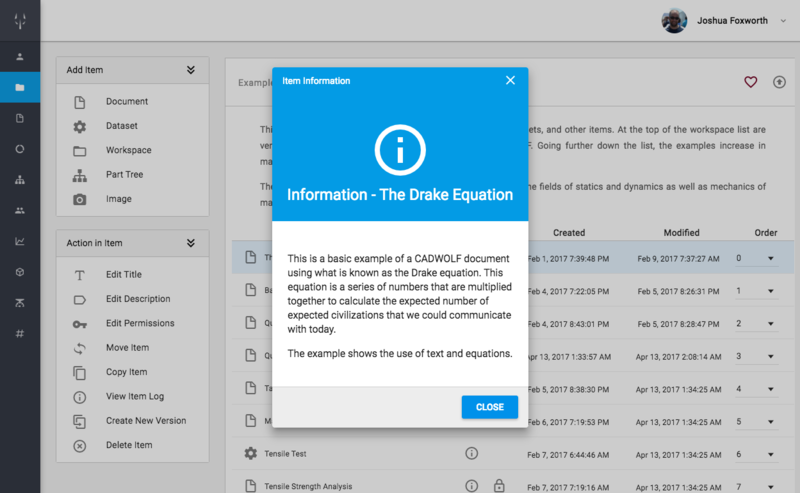 A dataset is another type of web page on CADWOLF that provides users with the ability to paste in text or read in a file. It then parses the text into an nth dimensional matrix and stores that data. The user can then import that data into any document and use it as a variable. 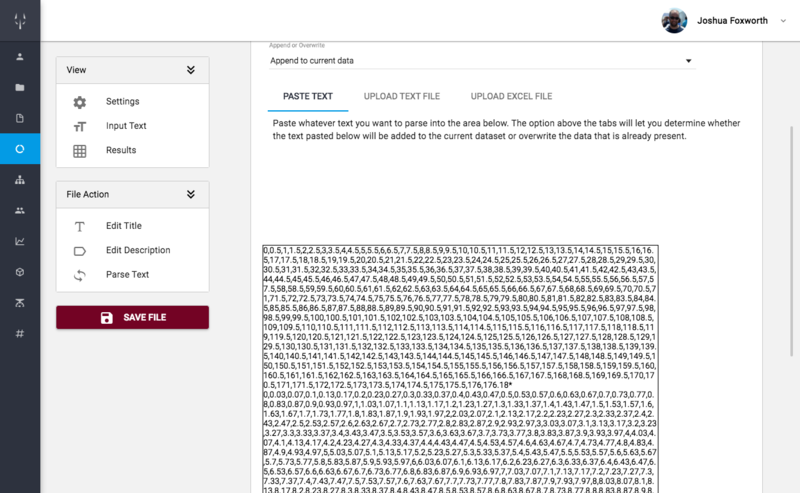 Whenever the dataset is updates, the document will change as well. 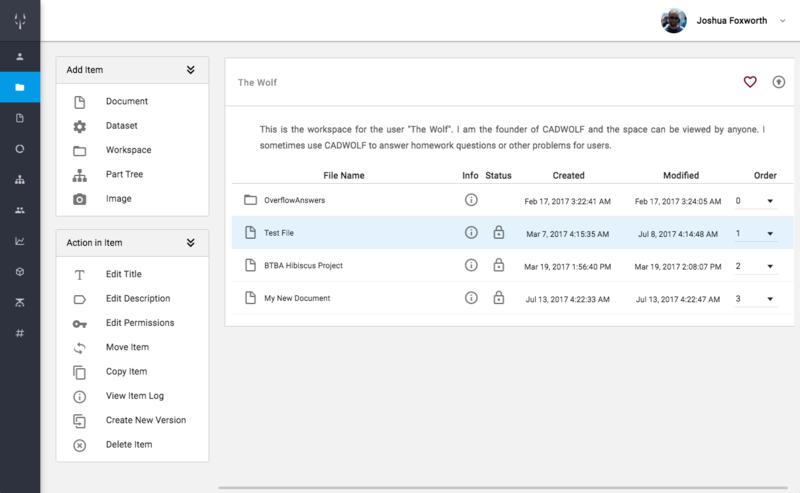 This lets users import test data, or any other type of data, and not have to worry about maintaining those files outside of CADWOLF. Whenever a large structure is designed, individual components are given part numbers that uniquly identify them and organize the structure. 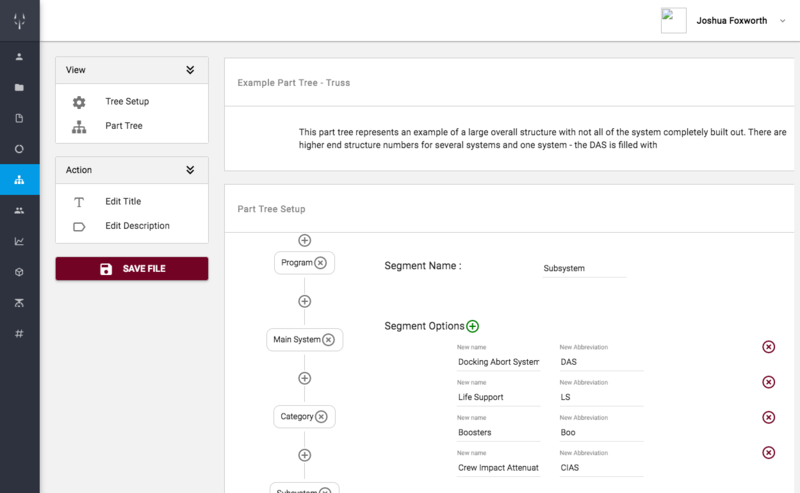 Part trees let users set up a part numbering scheme and build a structure piev by piece. Each component gets a document where the item is designed. 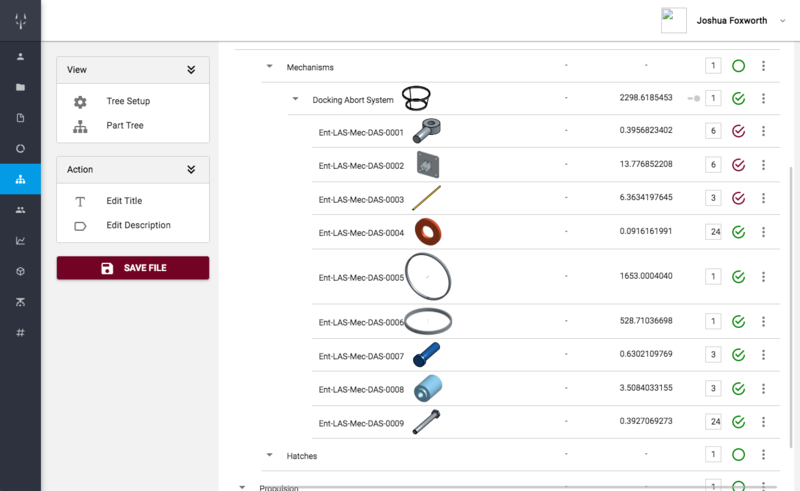 These items can be linked directly to CAD and the user can then viewed items like weight, mass, etc in real time. Workflows are Gantt chart like web pages that let the user create events to both catalogue real life events like tests and to establish reviews and other items. In a typical engineering process, the CAD and the design math are separate. In CADWOLF, the user can direclty link the mathematics to variables in the Onshape CAD system. Using those variables to define the CAD links the CAD and the math in CADWOLF. The benefit of this is that whenever a requirement changes, those changes propogate through CADWOLF letting the system redesign itself. Those changes are then pushed to Onshape and the CAD will likewise update. CADWOLF's simultaneous documentation and analysis and its direct link to CAD means that it can replace all these things and more. 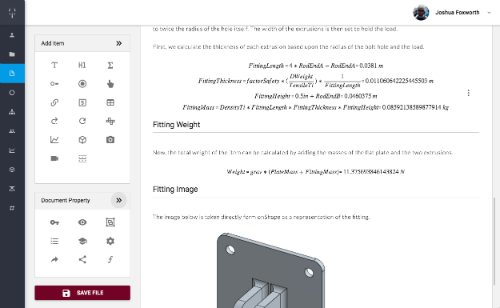 CADWOLF documents are spaces for users to solve and document the mathematics of designing components. In the document pictured here, the height and thickness of the vertical risers in the fitting are designed based upon the design load and tensile strength of the material. The diameter of the bolt is also established. When a requirement or design factor such as the load changes, the math automatically updates. These CADWOLF equations are then automatically sent from this document to an Onshape document. When the CADWOLF document is saved, those equations are sent here where they are stored as variables. When the fitting is designed in CAD, those variables are used to set the same factors here - height and thickness of the risers and the diameter of the bolt hole. This means that when the math changes in CADWOLF, the CAD updates here in Onshape. These changes change in the part design and then into the assemblies. This means that a properly designed CAD model updates autonomously in response to the changing math. The Onshape files can be read back into CADWOLF documents and items such as the weight, mass, volume, or density of the CAD model can be used in subsequent mathematics. 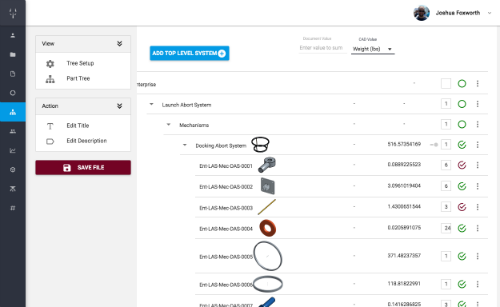 Those items can also be displayed for parts and assemblies in part trees as show here. 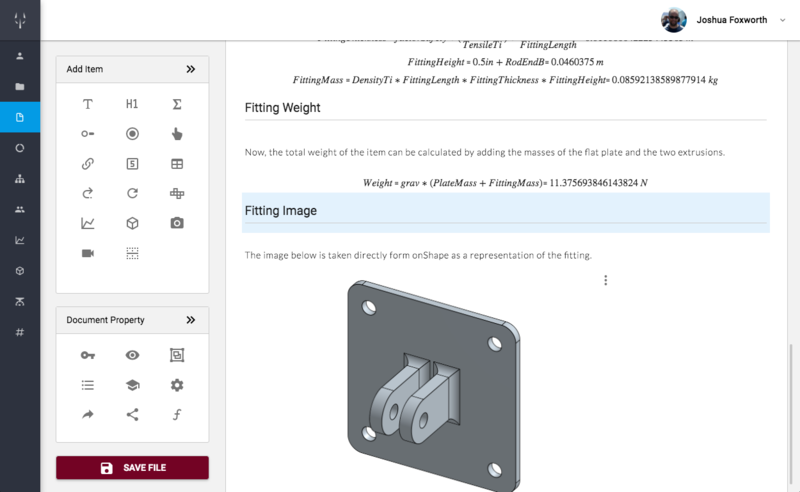 This aspect of part trees lets engineers see the mass, weight, volume, and other items for entire assemblies in real time as they are designed in CADWOLF. 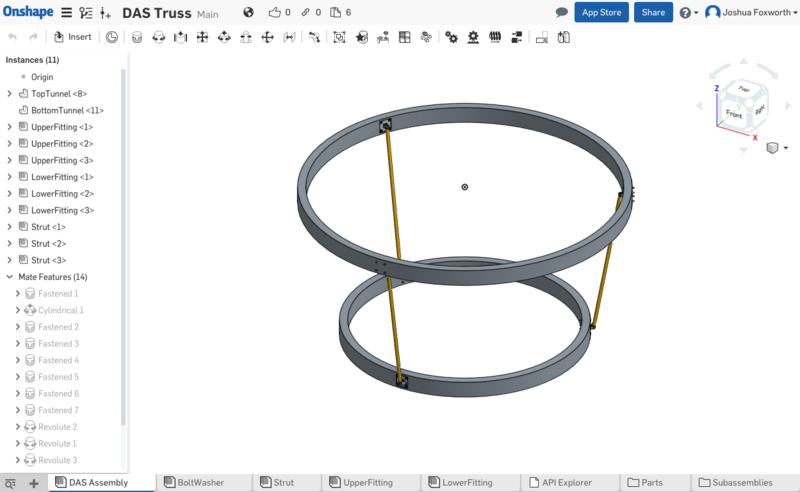 In other words, you can change the design weight of your truss - as in this example - and once the math and CAD updates, those changes are seen here. With both CADWOLF and Onshape, there is nothing to download or install. A complete engineering system available anywhere. We provide assistance to users and/or teams via google hangout or social media upon request at no charge. Email us for assitance at jfoxworth@cadwolf.com. You can also use CADWOLF's subreddit where we also answer questions about homework problems. You can also reach us on Facebook and Twitter. Tutorials are available at our youtube channel and in the link below. 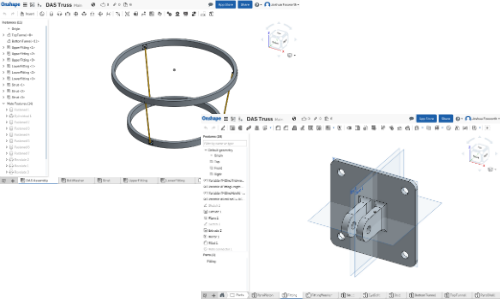 The parts workspace contains a number of documents with designs for items like bolts, nuts, washers, etc as well as CAD models. These can be copied into one of your workspaces and used in your designs. The projects workspace holds a number of open source projects that any user can ask to be added to and contribute the design. Anyone can browse these designs to get a better idea of how CADWOLF can be used. If you would like to have a part or project placed into the appropriate workspace, send us an email. You can always start your own project in your workspace.